My friend Bruce, who shared his story on my blog in the aftermath of the Travyon Martin shooting and is a good friend and an all-around awesome guy, preached for the first time (ever!) 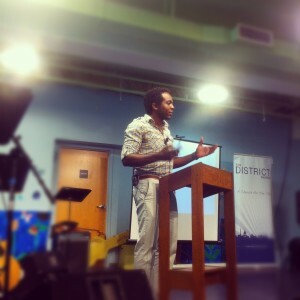 at The District Church on Sunday. We’re going through the Lord’s Prayer as a church, and he spoke on “Forgive us our debts as we also have forgiven our debtors.” And boy, did he hit it out the park! Forgiveness is a tough topic to talk about, and an even tougher thing to do; but as Bruce said in his sermon, it’s the one thing that Jesus tells us to do in this prayer, so it must be pretty important! Forgiveness is necessary because it reflects our faith in God. By forgiving our debtors we show that we believe in grace. Grace is not just an important component of our spiritual identity. It is the only reason we have a relationship with God. A refusal to forgive is a rejection of grace, and by extension, a denial of God himself. Also referenced in the message: Settlers of Catan, This American Life, Star Wars. Go listen to it now.